Born Feb 19 18191,2,5,6,7,8,16,17,18 [about 18174], Overton County, Tennessee1,2,5,6,7,8,16,17,18. 1 male under age 5 [Adolphus]. 1 male age 20-30 [Jehu]. 1 female age 20-30 [Cynthia]. Cynthia died May 30 18586 [May 30 185918], Woodford County, Illinois6; buried East White Oak Cemetery, Kansas Township, Woodford County, Illinois6. John Hinshaw, age 43, born in Tennessee; farmer; $5000 real estate; $1500 personal property. Adolphus Hinshaw, age 19, born in Illinois; farm laborer; attended school. William Hinshaw, age 17, born in Illinois; farm laborer; attended school. Cornelia Hinshaw, age 11, born in Illinois; attended school. Ellen Hinshaw, age 9, born in Illinois; attended school. Levi Hinshaw, age 7, born in Illinois; attended school. Alonzo Hinshaw, age 2, born in Illinois. Samuel Ramsey, age 16, born in Ohio; farm laborer; attended school. Polley M. Kelley, age 26, born in Illinois; domestic. Hinshaw, Jehu, age 51, born in Tennessee; farmer; $5000 real estate; $1300 personal property. Hinshaw, Mary, age 41, born in Illinois; keeping house. Hinshaw, Cornelia, age 19, born in Illinois. Hinshaw, Levi, age 17, born in Illinois; attended school. Hinshaw, Amos, age 14, born in Illinois; attended school. Hinshaw, Alonzo, age 13, born in Illinois; attended school. Hinshaw, Grant, age 6, born in Illinois. Hinshaw, George, age 3, born in Illinois. Hinshaw, Emma, age 7 months, born Nov 1869 in Illinois. Hinshaw, Jehu, age 61, born in Tennessee; father born in North Carolina; mother born in Virginia; farmer. Hinshaw, A. Mary, wife, age 53, born in Illinois; father born in Ohio; mother born in Virginia; keeping house. Hinshaw, Grant, son, age 16, born in Illinois; father born in Tennessee; mother born in Virginia; attended school 4 months. Hinshaw, George, son, age 13, born in Illinois; father born in Tennessee; mother born in Virginia; attended school 4 months. 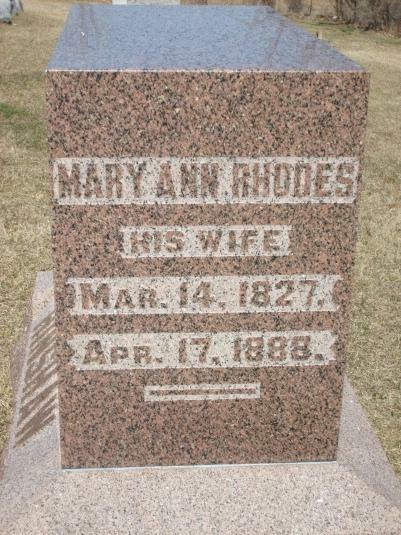 Hinshaw, Amy, daughter, age 10, born in Illinois; father born in Tennessee; mother born in Virginia; attended school 5 months. 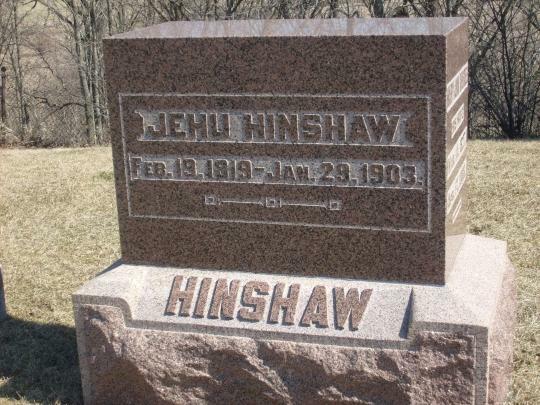 Hinshaw, Jehu, head-of-household, age 81, born Feb 1819 in Tennessee; parents born in Tennessee; married 8 years; occupation: landlord; owned home (free). 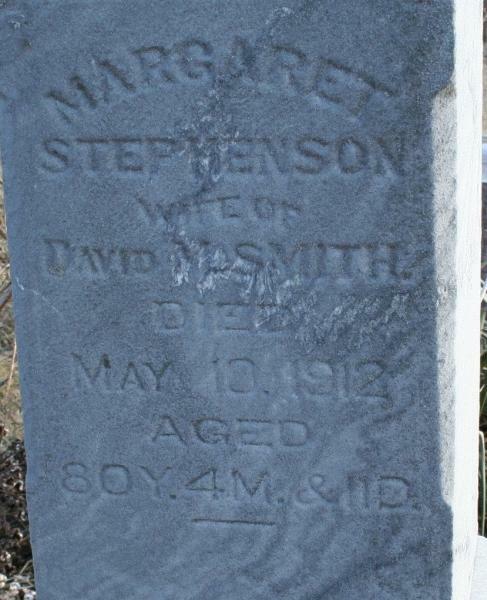 Hinshaw, Margaret, wife, age 68, born Dec 1831 in Illinois; parents born in South Carolina; married 8 years; no children. 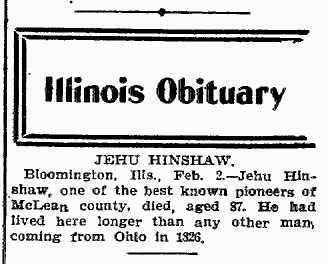 Jehu's obituary was published in "The Daily Review" (Decatur, Illinois) on Monday, February 2, 190326 (see scan below). Hinshaw, Margaret D., head-of-household, age 78, born in Illinois; parents born in Tennessee; widow; no children; occupation: own income; owned home (free). 1870 census, El Paso P.O., Kansas Township, Woodford County, Illinois; roll M593-295, page 314, line #5, dwelling #10, family #10. McLean County Historical Society; McLean County book D pg 299/249. McLean County Historical Society; McLean County book J pg 218. 1900 census, Eureka, Woodford County, Illinois; roll T623-356, ED 132, page 5A, line #46, dwelling #149, family #121. "McLean Co. Marriage Records 1831 - 1872", Book A, page 141. 1840 census, McLean County, Illinois; roll M704-65, page 282. 1910 census, 1st Ward, Eureka, Woodford County, Illinois; roll T624-337, ED 136, page 272B, line #57, dwelling #124, family #129. "The Daily Review", Feb 2 1903; http://www.ancestry.com.